3D-Sensor New Generation with integrated taper BT30 (80.365.30NG) | DamenCNC B.V.
Professional edge finder with analog display for fast and precise locating of edges and surfaces in X, Y, and Z. This german made precision part, has some clever features which will make your measurements easier. For example the dial has the tradional read out showing the 0,01 marks of how far the probe tip has been displaced. When you are using it in a CNC you would then normally have to compensate for the diameter of the probe tip in the CNC controller when setting a Zeropoint. 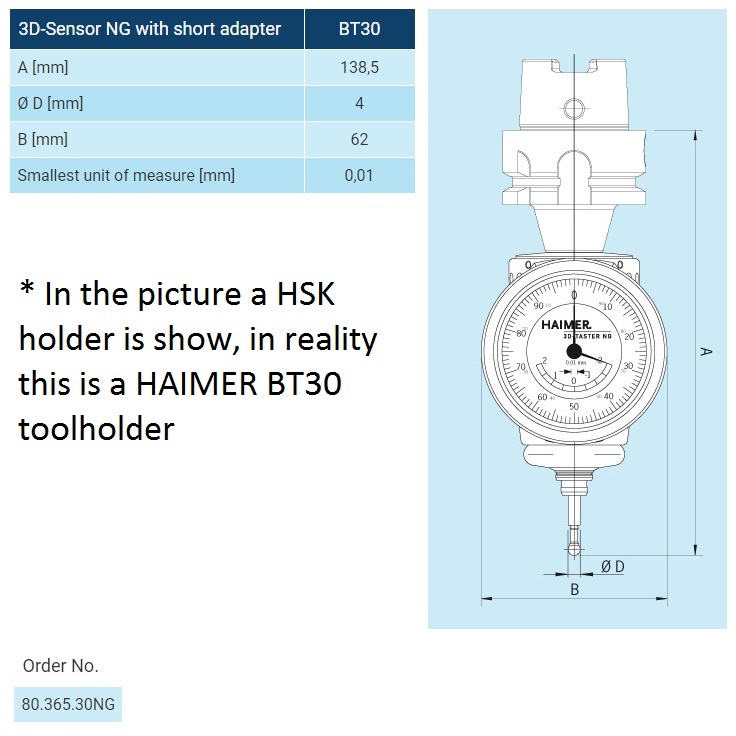 But this 3D sensor has an extra reading/print on the dial, where the probe tip diameter can be compensated. Basicly it means you can jog the machine an additional 2mm so that the center of the tool is exactly in line with the edge of the product. Now you can set the CNC controller to zero, without haveing to compensate for the probe tip diameter. This saves time, and prevents mistake from happening. Its very easy to enter -2 in the CNC controller, where it should be +2. 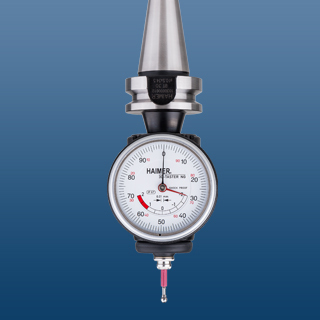 Smallest unit of measure of 0,01 mm / 0.0004"
Please take note: The given measuring precision of 0.01 mm only applies if the original HAIMER probe tips are used.